How Christianity conquered Western civilization. 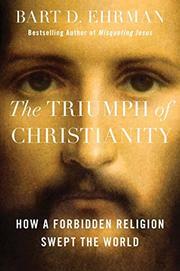 In his latest popular exploration of Christianity, noted New Testament authority Ehrman (Religious Studies/Univ. of North Carolina; Jesus Before the Gospels, 2016, etc.) asks, “how does a religion gain thirty million adherents in three hundred years?” In attempting to find an answer, he consults other scholars while looking at data, extant literature, and varied historical facts to explain the explosion of Christianity under the latter Roman Empire. The author begins in the usual place, with the life of Emperor Constantine, who converted to the Christian faith in 312 and changed the landscape of religious life in Europe from then on. In doing so, Ehrman makes the important point that it is difficult for historians to say what Constantine converted from. Indeed, having swept across the Western world, Christianity erased much of the pagan culture it replaced, leaving current scholars with little evidence of what once existed or even how Christianity made its swift advance. The author points out that conversion in the early years of the faith was not done “by public preaching or door-to-door canvassing of strangers” but instead by “everyday social networks [and] word of mouth.” With the notable exception of the biblical Paul, “the most significant Christian convert of all time,” few other traveling evangelists are identified in early Christianity. Converts were instead made by personal contact with other believers, yet at a rapid pace. Ehrman notes a number of characteristics that made Christianity attractive to Roman pagans—e.g., the emphasis on the church as family, care for the less fortunate, and promise of an afterlife—and once the emperor himself had joined, the door was opened to phenomenal growth. The author concludes with a look at post-Constantinian roadblocks to Christianity and the church’s own early forays into intolerance and violence. An accessible and intriguing but not groundbreaking history of the growth of Christianity.